This week, I will be writing a series of posts that focus on my research, dengue research as a whole, and Singapore's efforts to combat dengue from a public health perspective. While most of my blogging has centered on my exploration of Singapore and SE Asia, the vast majority of my time is spent in lab. Hopefully these posts will give a glimpse into the heart of my Fulbright project. Why study dengue in the first place? 2) There are no vaccines or treatments for dengue fever. Here in Singapore, there are many research efforts investigating dengue from many different perspectives. For my project, I split my time between two different labs. My primary base is at NUS, where I am a member of Prof. Thorsten Wohland's group. The lab is a fascinating study into the potential of interdisciplinary research. There is a healthy mix of physicists and biologists working on various projects, ranging from lipid membrane dynamics to cutting-edge microscopy development. Meanwhile, I bring my chemistry background to the group. One can read more about Prof. Wohland's work here. The research team is also part of a larger interdisciplinary group, the NUS Centre for Biological Sciences, or CBIS. This centre is then part of the Department of Biological Sciences (DBS). The dengue project, while new to Prof. Wohland's group, is part of a larger collaboration with multiple labs in Singapore. This research is taking place under an MOE Academic Research Funding (AcRF) Tier 3 grant, which provides significant funding for high-impact, multidisciplinary research. My second lab is also associated with this same grant. I have worked closely with Prof. Shee Mei Lok's group, which has a strong reputation with the virology world. Located at Duke-NUS graduate medical school, they specialize in dengue virus work. Specifically, they have elucidated a number of important features of dengue virus and its pathology of infection. The overall goal here is to study the dynamics of the virus, which will provide insight into its mechanism of infection. 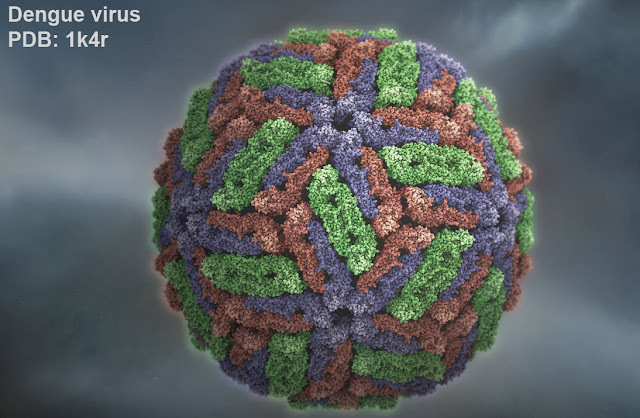 With this information, the development of drugs or specific antibodies targeting the virus will be more precise, resulting in better treatment for future dengue patients. This is an extremely exciting collaboration that should produce some very cool results. My first task was to obtain a sufficient amount of dengue virus to perform my other studies. This required over a month of virus culturing at Duke-NUS. Because the virus reproduces by infecting healthy cells, this involved both cell culturing and the propagation of virus with the aforementioned cells. All initial stocks of virus are taken from clinical patients, but over the years they are reproduced in laboratory settings. After enough virus was grown, we needed to purify the virus, which was fairly tricky. This step essentially removed dead or nonviable virus from the live, viable stock (which we will use in the later experiments). Using various centrifugal techniques and other methods, we got a pretty solid stock of virus. Much credit is due to Prof. Lok's team, who guided me through these steps. I also have begun some labeling studies, where we want to attach fluorescent labels to specific parts of the dengue virus. Variations in the emission properties of this dye yield a surprising amount of really important information about the virus and what it is doing on a tiny (ie, nanometer) scale. Highly sensitive microscopes are required in these situations (luckily, CBIS has plenty of these on hand). Much of the other time here has been spent organizing the project. From ordering chemicals to locating Biosafety Level 2 (BSL-2) cabinets, this has been more laborious than I imagined. However, because this is the very beginning of a multi-year, multi-lab project, organization is essential to running a smooth project. Tune in next time for an update about the current state of dengue research. Spoiler - a fifth type of dengue was just reported last week! This could have big implications for the entire field, but especially for vaccine research.